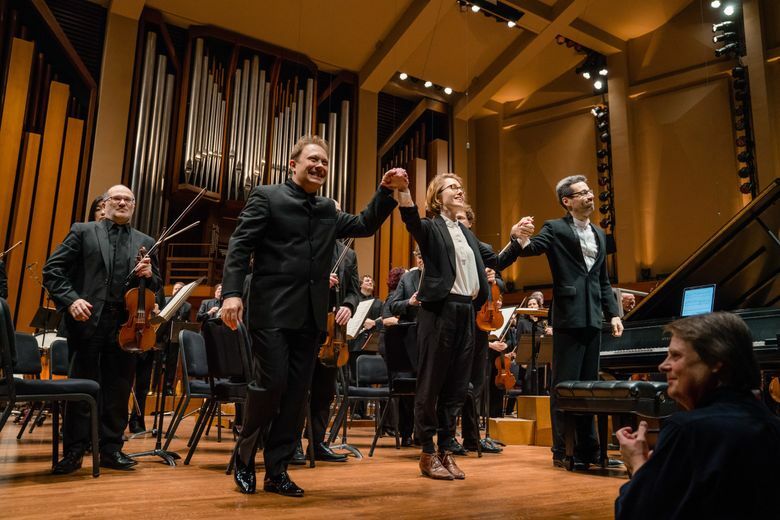 From principal oboist Mary Lynch’s reedy mastery to the politely timed coughing of its die-hard patrons (a mini-explosion between movements), the Seattle Symphony holds an eternal soft spot in my ex-oboe-player heart. But as a lapsed woodwind freak, I do not have such a predilection for piano concertos, or at least I didn’t until seeing two (two!) in the symphony’s latest offering Thursday night, pairing the classical canon (Shostakovich, Beethoven) with new work from Pulitzer Prize-winning composer Caroline Shaw — the youngest person to win a Pulitzer Prize for music when she did so in 2013 at age 30. Combine that with the whole-hog Symphony and the antic virtuosity of guest piano soloist Jonathan Biss, and the result is a focused evening that makes a strong case for Shaw’s innovative voice as a composer, and for the concept of piano concertos — at least when Biss is at the ivories. But first: Perhaps you have fears around classical music. Let’s address them. There’s no getting around the fact that classical music is built on ritual and restraint and ceremony. It’s bound by formalities you learn and internalize if you have any classical training to speak of — from the choreographed onstage handshakes to the rules about clapping (never between movements) to the oboist’s tuning note. That structure is purposeful and beautiful in its own way (if there is a more satisfying sound than a full orchestra tuning to that plaintive, sustained A, I’m unaware of it) but watching it live comes with an added bonus — seeing performers who are visibly having fun. And Jonathan Biss is a case study in it. Biss is a virtuoso pianist who performs with a haunted magnanimity that demands as close a vantage point as possible. On opening night, he perched on his piano bench so lightly it seemed he might blast right off. And then he did. At the end of every passage he played, he jerked up like a dancer on a wire, and was he actually shoving his fist in the air? I wasn’t sure the first time I saw it happen, but by the end of the Beethoven Concerto No. 3, he did it again and I knew my eyes weren’t playing tricks on me. A piano concerto isn’t always thrilling to watch, but these were. The complement to Biss’ seemingly inexhaustible energy was his versatile musicality. It was at times surprising to hear slower, softer, more evocative moments within the music coming from such a highly energized performer. With the eternal caveat that Beethoven’s most ragey, moody, crescendo-based, all-caps Beethoven moments are always better from a live orchestra, classical music nerds know what to expect from an evening of Shostakovich and Beethoven. The real wild card of the evening, then, is the world premiere of Caroline Shaw’s “Watermark,” composed in response to Beethoven’s Concerto No. 3. Hearing them back-to-back is an interesting exercise in music appreciation, but I was struck, mostly, by how different they are. “Watermark” is an innovative, exciting piece of music. When a piece of music manages to be rooted in classical tradition while still sounding completely new, it’s worth paying attention. Shaw’s piece also maximizes the structure of a piano concerto. Sometimes the interplay between a full orchestra and a piano can sound discordant and unbalanced, but here it seemed to make perfect sense, from Biss’ first searching notes played over lush strings to a convulsive exchange with principal flutist Jeffrey Barker. Just as a violin player learns to use the full range of her bow from frog to tip, Shaw plays with scale in her composition in a way that fully uses the tremendous power of the full orchestra, from isolating delicately plucked strings to creating space for soaring brass-forward moments. In approaching Beethoven’s work, Shaw did not create a simple copy. In the program notes for “Watermark,” she couches her process in more conceptual terms; it involved things like listening to different recordings of the piano concerto and zooming in on specific elements that could be adapted into a new piece — a three-movement structure (the middle third is the slowest), passages where the piano seemed to diverge from the orchestra, and a pervading sense of contrast. The result is a piece that feels sonically and spiritually close to the Beethoven score, but doesn’t require context as an adaptation to be appreciated. There are few things more complex and delightful to witness as an audience member than classically trained performers playing outside the confines of ancient traditions. The moment a principal ballerina appears center stage without pointe shoes, what you’re seeing is a performer re-imagining whole swathes of art out of its oldest, most elemental parts. When classical precision is applied to contemporary work, magic can happen, and it’s on full display here. Though steeped in tradition, Shaw’s work feels endlessly inventive, sweeping and strange, but never opaque for opacity’s sake. Like Biss’ near-levitation over his piano, Shaw’s work was like nothing I’d heard before.